Do you have an insect or rodent problem affecting your residential or commercial property? Armed with more than 20 years of experience, D&T Pest and Termite Control Inc. is ready to provide you with the pest control in Sharon, MA you need to eradicate ants, termites, mice, rats, bees, mosquitos, ticks, squirrels, bats, and more. The family owned and operated business has helped thousands of home and business owners with pest control in Sharon over the years and can help get your problem under control quickly. At the first sign of trouble, D&T Pest and Termite Control Inc. can send a specialist to your home or business to perform pest control in Sharon, MA. 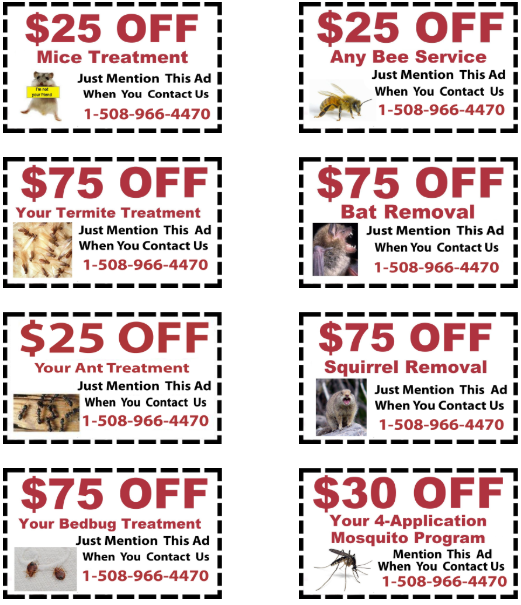 Whether you need mice treatment, termite control, ant control, bedbug treatment, bee removal, bat removal, squirrel removal, mosquito treatment, or tick treatment, D&T Pest and Termite Control Inc. has the products and equipment as well as the expertise to get the job done. A specialist will find the source of the pest problem in your home or business and attack it until all the insects or rodents are completely gone. If you fail to do something about a pest problem, it won’t be long before you have insects or rodents spreading out into other areas of your home or business. This could put your entire structure at risk and lead to different diseases being spread to both humans and pets. D&T Pest and Termite Control Inc. will eliminate the potential for these issues. Once you schedule services like ant control, mice treatment, termite control, bee removal, or mosquito treatment, you can rest easy knowing D&T Pest and Termite Control Inc. is on the case and offering the best pest control in Sharon, MA. For more information on pest control in Sharon or any of the specific pest control services, call D&T Pest and Termite Control Inc. at 508-966-4470.